Hanover Hound Bane a male is earmarked for dual purpose Police K9 or SAR, Trailing & Detection. K9 Bane will be trained in the five basic narcotics odors if going to LE. 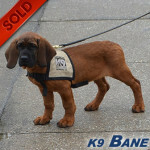 Bane will be suitable for law enforcement or an experienced SAR handler.